HomeMARKETGraph of the day: Is the denomination in US dollars about to end? The US dollar is on track to be hit by two heavyweights: China and global central banks. As the world’s largest oil consumer, China also has a massive impact on oil prices. The increase in demand for the Chinese currency will come at the expense of the demand for US dollars. This lower need for the dollar will cause a wave in all US markets. UU Foreign oil exports generally invest their profits in dollars in US assets. UU., Including Treasury bonds, a key source for financing by the United States of its deficit. However, if foreign oil exports are paid in another currency, it might make more sense to invest in that currency. In other negative news for the dollar, global central bankers may be fed up with President Donald Trump’s high-stakes poker game with China. It is reported that central bankers around the world are considering changing some of their currency reserves from dollars to euros. This would also create a reduced demand for the dollar. Although these two controllers weigh on the US dollar, the global reserve currency currently bounces in the hope that negotiations will keep all parties off the commercial battlefield. If the talks are successful, growth will resume, sentiment will improve and central bankers may not need to change foreign exchange reserves. However, the euro-dollar pair is negotiating along a pattern in which demand exceeds supply. Since January, the pair has been consolidating within a symmetrical triangle. This pattern shows that both supply and demand are willing to continually accept worse prices in relation to their position. Buyers are willing to continue paying more and sellers accept lower and lower offers. This means that both believe that the pair will continue to move in a direction that justifies accepting prices that are worse than previous levels. This week’s trade is struggling with an upward break, which would indicate that demand has absorbed all available supply at these levels and must go up to get more. This behavior generally forces bears to cover shorts, increasing demand. It also recruits more bulls, which recognize that the prevailing upward trend since mid-April will resume. The 50-week MA crossed over the 200-week MA in mid-February and throughout the development of the triangle. This shows that the price impulse was on the rise, even during consolidation. Conservative traders would expect a new high higher in mid-January, 1.2538 maximum, to confirm the integrity of the uptrend. This would also include a decisive break of more than 1.3 percent. They would wait for a 3.00 percent filter, to avoid bull traps and their probable return movement, to confirm the integrity of the pattern, with a green candle covering the real body of the previous red candle. Moderate traders could be satisfied with a break of 2.00, which would also publish a new maximum. They can expect a return movement for a better entry point, but not necessarily for confirmation of the support of the triangle. 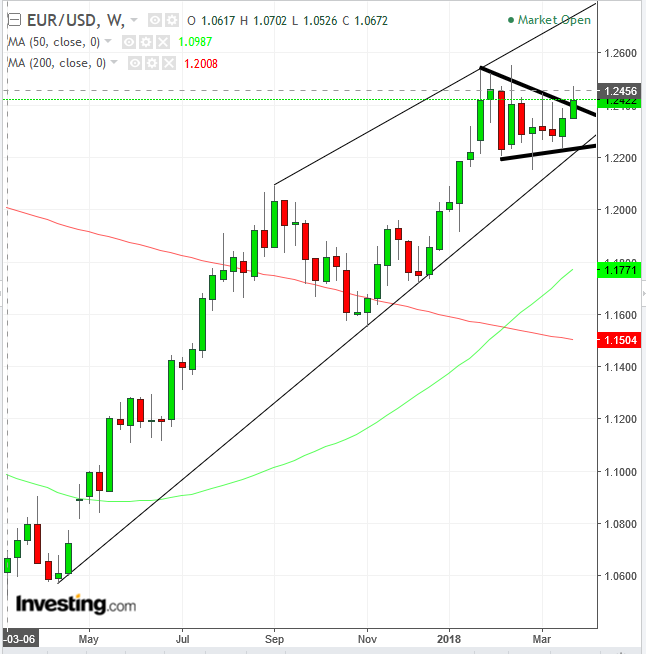 Aggressive traders can settle for just 1 percent penetration, taking the price above the psychological level of 1.2500, provided they can afford a significant stop loss, preferably below the upper triangle, below 1.24, or the risk of capital.